Lelouche and Suzaku (<3) extracted/partly re-CGd from this scan, outlines of wings vectored from scratch in Illustrator (with lots of eyeball referencing of original scan), and then ported over to Photoshop for tedious mouse-painting/textures/lighting. Two stone textures from Mayang. your mouse painting is so much better than mine, i really need to read some tutorials instead of just randomly doing stuff. Gosh, all this time you`ve been mouse painting? I`m completely amazed at it. With a mouse too?! I was hoping that you would vector this but at least you got that awesome wing. I wish the scan was more clean but that`s not your fault. I would say even prettier than the scans. like on one of those police line ups. I LOVE YOU! i was waiting for a big one of this! thank you very much its awesome! oh man just perfect! thank you very much!the wings really are something! Ahhh i was waiting for someone to do this! IT'S GORGEOUS! LOVE IT! You can really see the details in thier clothes, and the wings are really great too. I have always found that scan so appealing but never got the guts to work with it. I like how you extended the wings, simple yet really efective. lulu and suzaku your so cool! My only problem with it is that bat-type-kind-of wing. It's a little off - almost scrawny looking. Overall, I like what you've done ^^ Keep it up. Nice dark and light side pic! Love how the characters stand out from the background. Great scan as well, the fine details are amazing. Good job on the wings as well. Could fav it, but it's, uh, too bishounenish? Actually, I will, it deserves it. I like how you kept the sketchy lines CLAMP did with the original ones rather than vectoring it or not, it'll look too fake. But vectoring the wings was a very good decision, it makes the wings more real. Speaking about wings, its interesting how you changed them. In the original one, the wings are "closed and twisted" while yours are open. 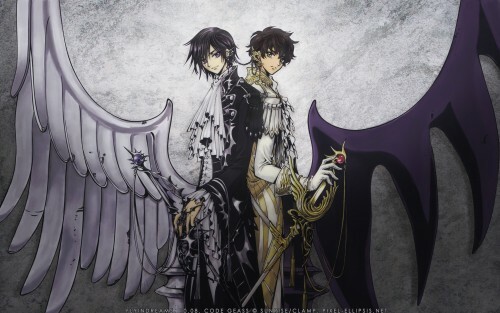 The left wing on Lelouch's side is nice but it doesnt look like the same size as the bat-like one. (as in, its not the same porportion) So its almost like it was half open. <--although, this is only me, i notice thigns that are uh..not really important. Other than that, i really love what you did with the wings and putting them in a lighter background. The lighting makes us concentrate more on their face. I dont know if you intended to do that, but it works!